A new online baby symptom checker has been launched by Nutricia Early Life Nutrition with the aim of facilitating conversations between healthcare professionals and parents about common feeding problems. 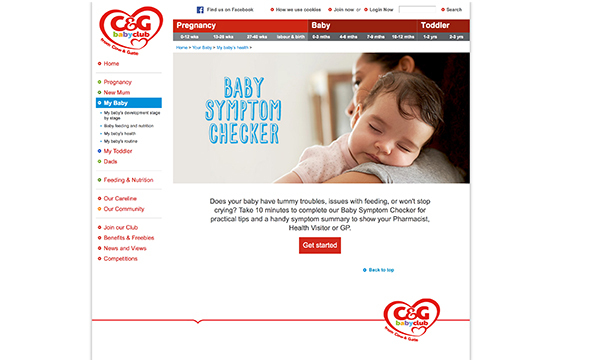 Developed in consultation with health visitors, GPs and paediatric dietitians, the online checker gathers information on the baby’s symptoms through a series of quick multiple choice questions and offers practical advice to help alleviate symptoms. Question help users decipher if symptoms indicate something serious or requiring urgent care. It offers a handy symptom summary in a PDF format which parents and carers can either show a health visitor during a visit or send by email. It is designed for parents and carers of babies under 12 months who show signs of common feeding problems such as colic, constipation and reflux. Even so, health visitors can refer parents and carers to it to facilitate conversations with them and help reach a diagnosis. Users should note that it does not offer a clinical diagnosis and is not designed to replace medical advice from a healthcare professional.